Jazz pianist turned roots musician, Sam Reider, is redefining American music on the accordion. He has been featured at Lincoln Center and on NPR, and performed alongside pop stars, virtuosos, and folk musicians around the world, including Jon Batiste and Stay Human, Americana singer Jim Lauderdale, and Grammy Award-winning Venezuelan musician Jorge Glem. Reider’s debut record, Too Hot To Sleep, presents his distinct compositional voice alongside an ensemble of top-drawer musical collaborators and compadres called The Human Hands. 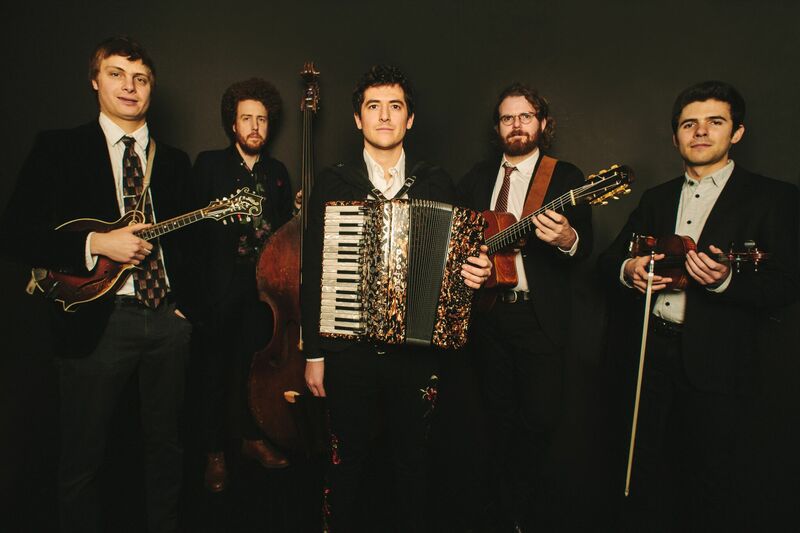 Sam Reider and The Human Hands are a collective of virtuoso jazz and bluegrass musicians and some of the most in-demand young acoustic musicians on the scene in Brooklyn, NY. Along with Sam, they include mandolinist Dominick Leslie (Michael Daves, Tony Trischka, The Deadly Gentlemen, Hawktail), Saxiphonist Eddie Barbash (Jon Batiste and Stay Human), guitarist Roy Williams (Stephane Wrembel), and bassist Dave Speranza (Jim Campilongo). This duo is locally famous and internationally known, –bringing traditional and world music to the Old Waterford School stage. Multi-instrumentalist and mandolin master Danny Knicely has a distinctive musical voice along with Aimee Curl’s bass and breathy and sublime voice. They play touching and moving original tunes and beautifully interpret some of the oldest songs written.